The Big Scoop offers as much of the sweet dairy treats as you can eat! 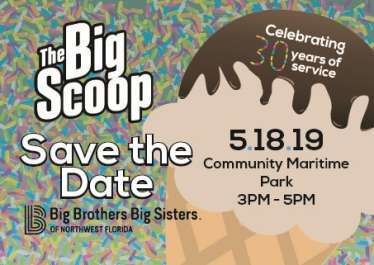 Join us as we celebrate our 30th anniversary of service with the sweetest party in town! Attendees can taste an assortment of ice cream flavors, top with the best fixins' and try out others sweet snacks. There will be fun, games, and activities for everyone in the family! This is a pet-friendly event! Tickets are $10 each, and children under three get in free! Proceeds benefit Big Brothers Big Sisters of Northwest Florida. Buy your tickets online or at the event!